Visit the beautiful ruins of Tulum, the only Mayan city build on the coastline. Our private tour makes this trip easy and comfortable. 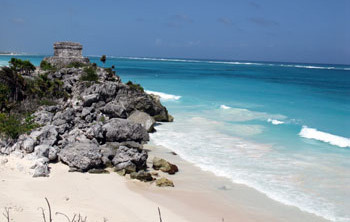 You decide the pickup time at your hotel and you can stay in Tulum as long as you like. You can add on options for reef snorkeling or snorkeling in the ocean with sea turtles at Akumal, Mexico. Akumal Sea Turtle Snorkel. Snorkel with the sea turtles in their natural environment. Easy and safe snorkeling right from the beach. Includes snorkel gear. Additional cost: $30 per person. Pack for this tour: Sunblock, sunglasses, hat, bottle of water, camera (towel & swimsuit if swimming).